If you're a bird watcher ... and you're older than about 45 or so, you almost certainly know this book. Peterson's book used to have roughly the same standing as Sibley's books do today. This particular copy was printed in 1958, when I was but 6 years old. My mother bought it new, and I remember that for years she kept the slip cover on it, to use as a bookmark. I spent many hours at the big “picture window” in our living room, often with her, watching the birds that we fed in our back yard. 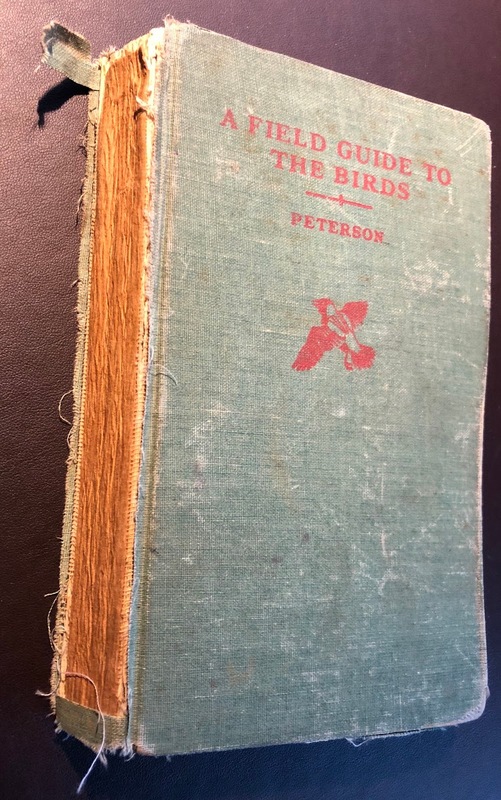 We'd look up birds in Peterson's book, and she showed me how to use the identifying features that Peterson marked, and how to look up the text on each bird. Refilling those feeders was often my job, and in my teenage years so was repair and construction of the platform feeders (my dad wasn't very good at this sort of thing). This poor, worn volume lived through most of that period. Before she bought this then-new volume, my mom had an older edition, purchased used, and very beat up. I remember that she gave that older edition away, but I can't remember to whom. When my parents moved to southern New Jersey, she fed the birds there, too – and this little book, her birding bible, went with her. It went with her when my parents later moved to Virginia, where again she fed the birds. Finally, when she moved to Utah she hoped to feed the birds here as well, though she never did, and she brought this little book with her.